Stem Psychrometer is a self contained, stand-alone instrument for the measurement of stem water potential. It can continuously log (at 10 minute temporal resolution) changes in the plant water status which directly reflect the energy required to access water or the stress the plant is under. 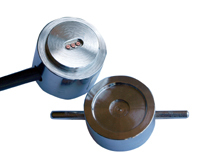 The PSY-1 Stem Psychrometer consists of two welded chromel-constantan thermocouples connected in series within a chromium plated brass chamber that forms a large insulating thermal mass. Inside the chamber one thermocouple is in contact with the stem sample and the other simultaneously measures the chamber air temperature and subsequent to a Peltier cooling pulse, the set bulb depression. A third soldered copper-constantan thermocouple is located within the sample chamber body to measure the instrument temperature for the purpose of temperature compensation. All temperature measurements (dT, Wet Bulb depression & chamber temperature) are then used in the determination of plant water potential. 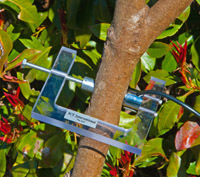 The PSY-1 in-situ Stem Psychrometer is a powerful research tool for evaluating the consequences of plant-environment interaction in terms that are directly relevant to the plant's capacity to withstand stress and to assess mechanisms of stress response and recovery. 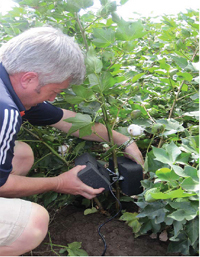 One direct application of the technique in cotton production is to improve irrigation scheduling and interpreting plant response and production to irrigation events. In the photo ,Installing foam around the Stem Psychrometer for thermal insulation from rapid ambient fluctuations. An additional layer of aluminium foil wrapped around the foam is also required to reflect direct radiation which would also generate an elevated and variable thermal gradient within the psychrometer chamber.